The truth about the Clintons and Haiti. The Clintons Didn’t Screw Up Haiti Alone. You Helped. Trump has turned Haiti into the new symbol of Bill and Hillary’s crookedness. If only things were that simple. Former President Bill Clinton and his wife, presidential candidate Hillary Clinton, at the grand opening ceremony of the new Caracol Industrial Park in Caracol, Haiti, Oct. 22, 2012. Last week, during a swing through Miami, Donald Trump stopped by a community center in Little Haiti. Trump has never held much interest in Haiti or Haitian Americans, and it showed. Instead of the usual bluster, the reality TV star tentatively read some vague, prepared remarks off a sheet of paper, then sat back on a stool “to listen and to learn” for a few minutes from the small crowd of mostly middle-aged, upper- and middle-class Haitian Americans in dark suits and print dresses, scattered among a few rows of folding chairs. Not long ago, Trump’s team glommed onto the possibility that Haitian Americans—generally black, generally Democratic-leaning voters who make up roughly 2 percent of the population of Florida, where Trump and Hillary Clinton are separated by less than a point—might be persuaded to vote against the former secretary of state. The irony of a nativist pandering to thousands of immigrants and refugees aside, there was a logic to this. Many people rightly identify Clinton with failures of humanitarianism and development in Haiti. The Trump team has folded that perception into a half-true narrative in which Haiti—like Whitewater and Benghazi before it—becomes a synecdoche for all the ills, real and imagined, of the Clintons themselves. There are good reasons the world’s first black republic has been an island-sized headache for Clinton as she seeks the presidency. Haiti is a place where some of the darkest suppositions that lurk on the left and right about her and her husband take form. Here is an island country of 10 million people where America’s ultimate power couple invested considerable time and reputation. Here is a fragile state where each took turns implementing destructive policies whose highlights include overthrowing a presidential election. Bill Clinton in particular mixed personal relationships, business, and unaccountable power in ways that, if never exactly criminal, arouse the kind of suspicion that erodes public trust. No two individuals, including Haiti’s own leaders, enjoyed more power and influence than the Clintons in the morass of the failed reconstruction following the deadly Jan. 12, 2010, earthquake, when a troubled country managed to go from catastrophe to worse. The Clintons compounded the resulting political problem the way they usually do, by saying as little as possible while letting their enemies fill in the blanks. A year before he became Trump’s campaign “CEO,” Breitbart News chairman Steve Bannon began pushing facile theories of corruption and malfeasance in the book Clinton Cash, written by Peter Schweizer under the aegis of Bannon’s Orwellianly named Government Accountability Institute. It was later turned into a film. Both versions of Clinton Cash tell a kaleidoscopic version of Haiti’s post-quake story, remixed and more than occasionally fudged to push the Clintons into the center. Those flawed but relatively measured accounts in turn inspired whack-job theories that have become articles of faith in the anti-Clinton fever swamps, such as the fantasy that Hillary and Bill just straight up stole billions of dollars in post-quake relief money—an impossible claim so unmoored from reality that even Peter Schweitzer didn’t bother making it. The reality is a lot more complicated (and interesting) than that. The United States and Haiti were the first two independent republics in the Americas, and our often blood-soaked relationship goes back a lot further than the meeting of a silky Arkansan and an ambitious Illinoisan at Yale Law School. Trump, probably unwittingly, submerged himself in some relatively recent chapters of that history at the Little Haiti Cultural Center. His host was Georges Saati, a wealthy Lebanese-Haitian industrialist whose family backed the brutal 20th-century dictatorships of François and Jean-Claude Duvalier and whose far-right faction helped foment the violent overthrow of President Jean-Bertrand Aristide in 2004. Trump was also treated to a speech by Bernard Sansaricq, a radical right-wing ex-Haitian legislator whom the Los Angeles Times once called the “self-proclaimed president of Haiti’s Senate” and who collaborated with the military junta that ruled during Aristide’s first exile in the 1990s, following a coup carried out during the George H.W. Bush administration by former Duvalierists on the CIA payroll. Trump was so moved that this week, his staff published another statement by Sansaricq on its website. He didn’t. I know, because I’ve spent years looking into what’s really gone on in Haiti. I was the Associated Press correspondent in Port-au-Prince from 2007 to 2011 and survived the earthquake in 2010. I’ve spent years digging into the details of the response and recovery, much of which I put in a book. I’ve also done extensive, critical reporting on the Clintons’ roles in particular, which is why my name appears halfway through the Clinton Cash documentary, misleadingly implying that I was some sort of corroborating source. In all that time, neither I nor anyone else has found the coveted evidence of either Clinton making off with vast sums of money from Haiti or the relief effort. And while America’s foremost power couple may be as culpable as anyone for the disastrous results of the earthquake response, it is fundamentally misleading to say that they are singularly responsible for it, much less for America’s long and abusive history with its oldest and poorest neighbor. I wish things were that simple. Clinton has gotten grief in this election for that kind of thinking, exemplified elsewhere by a 2011 speech in which she pitched reconstruction in Iraq, eight years after the U.S. invasion, as a “business opportunity.” In reality, what she is pushing has been standard U.S. foreign policy for more than a century. (In Iraq, she was very late to the party.) It’s no less true when it comes to “humanitarianism.” The U.S. government devotes less than 1 percent of its budget to “foreign aid,” most of which goes to vendors based in the United States. For instance, nearly half a billion dollars of U.S. government relief aid “for Haiti” following the 2010 earthquake went to the Defense Department. The vast majority of U.S. government contracts went to American firms; almost no cash ever went, or was intended to go, to Haitians or the Haitian government. The same is true for nearly all nongovernmental organizations and charities, including the American Red Cross. Despite promises to change this way of doing aid, both Clintons rode herd on business as usual—Hillary as head of the State Department (which effectively includes the U.S. Agency for International Development, or USAID), and Bill in his panoply of roles, including co-chairing the Interim Haiti Recovery Commission (IHRC), a nominally Haitian government agency charged with overseeing the allocation of reconstruction money donated by foreign governments to a World Bank–managed fund for 18 months after the earthquake. * USAID, ignoring recommendations to hire Haitian contractors, brought in several U.S. firms (and one Mexican firm) to build a housing development. The added cost of flights, hotels, cars, food allowances, living expenses, and “danger pay” ballooned the cost per house from $8,000 to $33,000, investigative reporter Jake Johnston found. Ultimately two of the American contractors were suspended from receiving future government contracts. “Out of ignorance, there was much arrogance,” a Haitian official told Johnston. Before and after the earthquake, the State Department openly and enthusiastically pushed a vision of prosperity for Haiti through foreign investment in tourism, construction, and low-wage garment factories. In its view, this would save Haitians from poverty and prevent future refugee crises while making money for American and multinational corporations. That idea is badly flawed—among other things, the low wages and sweeping tax exemptions investors demand mean little money flows into the local economy—but it’s the program every single U.S. presidential administration has backed in Haiti since at least the 1960s. In the 1970s and early 1980s, Haiti produced huge quantities of cheap clothes, toys—and at one point all the baseballs used in the U.S. major leagues—earning it the nickname the “Taiwan of the Caribbean.” It’s a bipartisan effort: Clinton’s vision of “economic statecraft” isn’t all that different from the policies Ronald Reagan was pushing when his administration created the Caribbean Basin Initiative. But efforts to resurrect the assembly sector, which collapsed in the turmoil following the fall of the Duvalier dictatorship 1986, got ugly. A few months before the quake, U.S. embassy officials pressured the then-Haitian president, René Préval, to nix a legislative proposal to raise the minimum wage for garment factory workers from roughly 22 cents an hour to 62 cents an hour, arguing that higher wages would discourage investment. Préval and legislators compromised at 38 cents an hour. (It has since gone up.) Bill used his newly minted position as U.N. special envoy to promote the economic agenda. “In the end all of our efforts will have to be judged by how many jobs we create, how much we swell the middle class, and whether we perform for the investors and make them a profit for doing the right thing,” he said at the time. Once the disaster struck, the U.S. government focused its reconstruction efforts on pushing this vision. That resulted in the construction of Caracol Industrial Park, a $300 million, 600-acre industrial development built to house garment factories in northern Haiti. The project was financed through U.S. tax money via USAID, as well as the Washington-based Inter-American Development Bank. The Clinton Foundation helped promote the project to investors. Bill and George W. Bush teamed up to lobby Congress together to expand trade preferences for Haiti-sewn apparel. Bill also used his position with the IHRC to direct further funds to the project. With the help of U.N. Secretary-General Ban Ki-moon, a former South Korean trade minister, the organizers recruited Sae-A Trading Co. Ltd., a South Korea–based global garment giant that supplies many of the clothes you buy at Target, Walmart, Gap, Old Navy, and other stores, to be the anchor tenant. All that was at stake when, 11 months after the earthquake, Haiti held a presidential election. Millions were still displaced and polling places in rubble, but the United States and its allies were paying for the election and insisted it go on. The process fell into chaos in the first round, with riots in the streets and candidates accusing each other of manipulation and fraud. Clinton’s State Department played hardball behind the scenes, revoking the visas of Préval’s inner circle and banding with France, Brazil, Canada, and the United Nations leadership to pressure the president into stepping down. Hillary delivered that message almost word for word to the Haitian and foreign press the next day. Behind closed doors, she sweet-talked Préval, convincing him that accepting the U.S.-backed candidate would secure his legacy. Martelly became president in May. In his inaugural speech he declared, in English: “This is a new Haiti open for business, now!” Bill was in the audience. Initially, Martelly accepted Garry Conille—Bill Clinton’s chief of staff at the U.N. Office of the Special Envoy—as his first prime minister. But sensing a babysitter, Martelly quickly booted him out and replaced him with his own business partner. “The situation cannot afford Washington to sit on sidelines. They elected him and they need [sic] pressure him,” Graham grumbled to Mills in an unusually candid email. The earthquake recovery foundered, inflation spiraled, and violence spiked. Martelly left office earlier this year amid an unfinished, fraud-wracked election; for a week, the country had no president. Haiti is now struggling with a weak, transitional government. Demonstrations loom, as do strikes and threats of takeover by armed militants. Caracol opened in 2012 with both Clintons joining Martelly (and an acquiescent Préval) at the opening ceremony. The project has been a disappointment by any measure. Sae-A brought in a fraction of the jobs it promised. Its employees grumble about the long hours, tough conditions, and low pay. The project has had little positive impact on Haiti’s economy so far. Trump has criticized Caracol on the stump, referring in a recent speech to the time that “Hillary Clinton set aside environmental and labor rules to help a South Korean company with a record of violating workers’ rights set up what amounts to a sweatshop in Haiti.” It’s a hypocritical complaint for a mogul who employs his own sweatshop labor in China and Central America. Small wonder that he dropped that line of criticism at the Little Haiti event, where his hosts were wealthy industrialists whose opposition to Aristide (and Bill Clinton) was rooted in large part in the former Haitian leader’s resistance to garment-factory owners and foreign investment schemes. Still, it’s only a bit overstated—while Hillary built nothing alone, her State Department pushed hard to get the park up quickly, over the objections of other administration departments. But what the shallower critics of the Clintons miss is whom this fundamentally unjust system is designed to benefit. Despite cherry-picked, half-understood stories about permits for nonexistent gold mines and isolated instances of naked (and duly punished) fraud that account for rounding errors in the actual billions raised and spent after the earthquake, there is simply no evidence that the intent was to line the Clintons’ pockets. The system isn’t designed for them; it’s for us. The low wages that the U.S. embassy helped suppress are the reason we can enjoy a steady stream of $9 Mossimo camisoles and $12.99 six-packs of Hanes T-shirts. Even U.S. military uniform parts get made in Haitian sweatshops. As America moves further away from its producer past and deeper into its consumer present, we will want cheaper and cheaper smartphones and cheaper and cheaper clothes that we can afford on our stagnant service wages, and we will demand our leaders find us alternatives to sourcing from rivals like China. Places like Caracol are the result. Some Americans say they want production jobs to come back home, but few are ready to pay twice as much for their clothes or $100 extra for their iPhones, most of which would still have to be sourced from overseas. To get the things we want, the United States has been in the business of overturning elections and toppling governments for more than a century. Clinton’s trip to Haiti in 2011 represents the softer end of a long tradition of U.S. invasions, coups, and usurpations: Panama in 1903 to Iran, 1953; Guatemala, 1954, to Congo, 1961; Vietnam, 1963, to Chile, 1973, to Iraq 2003, and on and on. The U.S. Marines occupied Haiti from 1915 to 1934, helping foster the overcentralization—whereby American-run businesses and breaks on custom duties were concentrated in the capital—that made the 2010 earthquake so deadly. And we have been meddling ever since—ferrying leaders out and in and out again. As Trump was reminded in Little Haiti, Bill Clinton ordered the 1994 U.S. invasion. George W. Bush ordered his in 2004. The U.N. peacekeeping mission that dumped cholera into Haiti’s waterways a few months after the quake had nothing to do with Clinton’s U.N. Office of the Special Envoy; it was created years earlier, during the Bush administration, to take over from his U.S.-led force and has been kept there and aggressively defended by administrations through Barack Obama’s in large part because it is cheaper than sending U.S. troops back again. That military might is used, explicitly, to keep things from deteriorating to the point that thousands of Haitians flee toward Florida, as they did in the 1980s and 1990s. Why? Because as it turns out, a lot of Americans aren’t fond of refugees. None of this gets the Clintons off the hook for the actions they are personally responsible for in Haiti. I’ve asked Hillary’s spokesman many times to comment on how things have turned out there and what if anything she would do differently as president. He said once that she’d comment “when the time comes to do so.” That was back in April 2015. I’m still waiting. Bill continues to mix his post-presidential fame and Haiti business matchmaking in ways that set off alarm bells—often in conjunction with his trademark quarter-million-dollar speaking fees. In the reconstruction effort, he often partnered with Irish cell phone company Digicel and its head, Denis O’Brien. The company helped arrange at least one lucrative speaking engagement for the former president, while the Clinton Foundation “facilitated introductions” to help O’Brien build a luxurious new Marriott hotel next to Digicel’s Port-au-Prince headquarters. USAID has directed about $1.3 million to Digicel since 2008, along with private grant money. 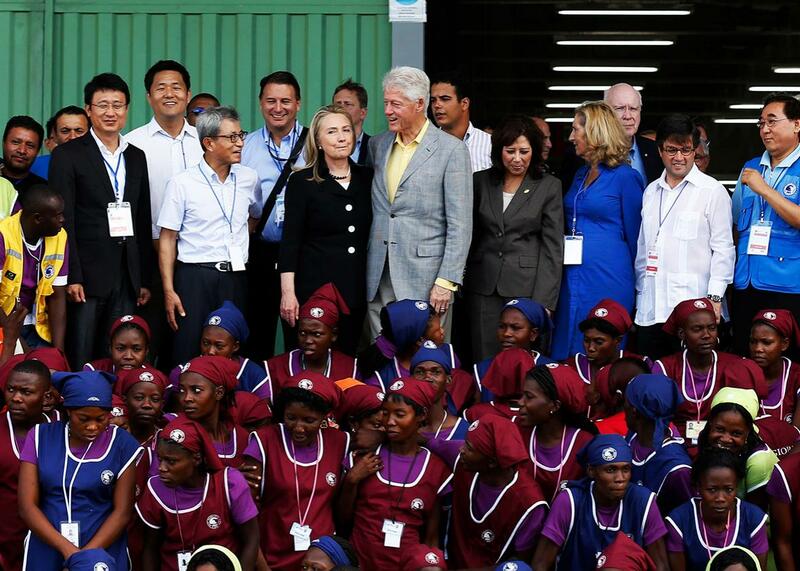 Digicel has donated tens of millions of dollars to the Clinton Foundation. It’s hard to say how, or even if, any of those parts fit together: Digicel was dominating Haiti’s cell phone market and doing development work there long before the Clintons re-engaged with the country in 2009. USAID money started going to Digicel while George W. Bush and Condoleezza Rice were running U.S. foreign policy, and most has been paid out since Clinton left the State Department. An indirect speaking fee is hardly proof of a kickback scheme. Still, the relationship is clearly an example of the many ways money and celebrity combine and strengthen each other at the highest levels of power. But it ignores all history and logic to pin the whole sordid tale of Haiti’s relief and reconstruction disasters on one couple, no matter how powerful they have been. Turning legitimate criticisms about U.S. intervention into a question about one candidate’s personality is a way of avoiding harder questions. The Clintons didn’t create the world we live in; they just know how to navigate it better than most of us do. If we want it to change, we have to change it. And it seems clear that electing a strongman leader who turns to putschists for advice on the developing world and who has never shied away from making money by working with corrupt regimes isn’t the answer. Changing a system that operates with millions of people and trillions of dollars will take more than shunting all the evils of empire onto one or two personalities—not when we benefit from them so eagerly and almost never change ourselves when it counts. Pretending otherwise is just a way to let ourselves off the hook, too.